Home › QuickBooks and Sync › Journal synchronization error: Transaction split lines to accounts receivable must include a customer on that split line. Users may receive the following synchronization error if GL Accounts have been set at the Warehouse level in Configuration Manager. SubmitGLJournalBatch: error while creating journal entry 1555: There was an error when saving a General Journal transaction. QuickBooks error message: Transaction split lines to accounts receivable must include a customer on that split line. In Acctivate, open Configuration Manager and browse to Inventory -> Warehouse. Here, review each of your warehouses and the GL Accounts assigned to each of the Inventoried accounts section. These GL Accounts should NOT be set to an Accounts Receivable or Accounts Payable type GL Account. In the screenshot, above, you can see the typical configuration of each of these types of transactions and the related GL Account. 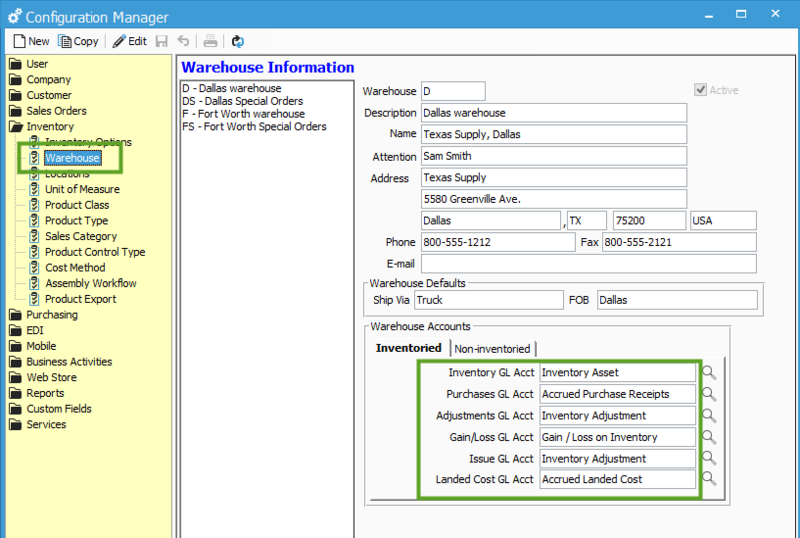 You can edit the Warehouse Configuration Manager window and select the proper GL Account and save. Then, you should be able to run a synchronization with QuickBooks and the errors should be resolved at this point. For more information regarding transaction GL Accounts, click here.